Are you looking to bring your dry hair back to life? This DIY homemade dry hair mask is a simple way to restore and moisturize your hair without spends too much cost on hair based products. Every ingredient is natural and will be available in your kitchen, so you can easily make incredible dry hair mask to get rid of frizz, damages, and calm scalp irritation. Before starting the hair mask recipe, let’s understand how each ingredient affects your hair. Banana - is rich in potassium, natural oil and vitamin A which help in softening the hair and protects breakage on hair. Greek Yogurt - is a low-fat food product that contains hair strengthening vitamins which has the ability to repair skin cells, nails and hair. Olive Oil - There is no need to tell anything about olive oil benefits, it contains anti-inflammatory properties that promote scalp health and prevent dryness. It is also rich in fatty acids and vitamin E to make hair growth fast. Honey - is one of the star ingredients for hair, it is full of antioxidants and nutrients which help to moisturize and shine the hair. 1. 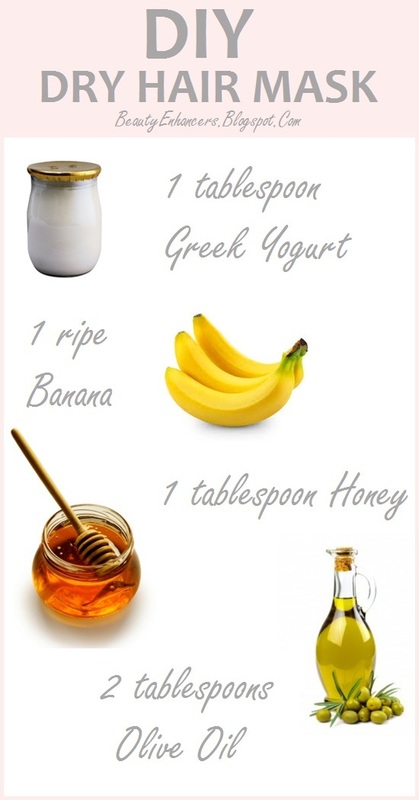 Take one ripe of banana and one tablespoon of Greek yogurt in a bowl. Mash it with a fork until it becomes homogeneous paste. 2. Now add one tablespoon of honey and two tablespoons of olive oil and mix them well. You can use blender but little amount you will be lose. Apply the mask on wet hair and cover your head with plastic wrap or shower cap at least for 30 minutes. After 30 minutes, rinse your hair thoroughly. Have you tried any mask, please share here in comment below.